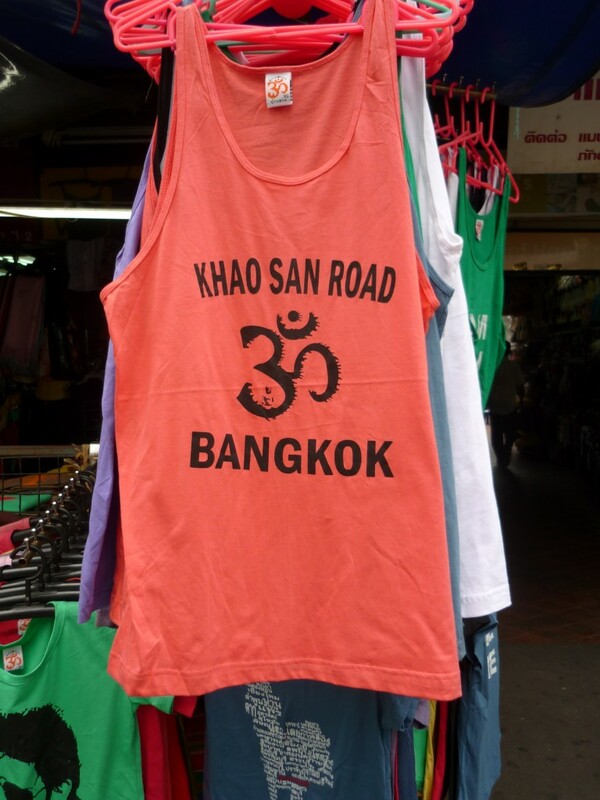 The whole Khao San Road area seems to require a certain uniform to enter it: hareem pants, parachute pants, drop-crotched pants- call them what you like, but if you ain’t wearing them, you soon get seduced by the sheer scale of availability in the billions of stalls. You’re likely to find yourself convincing youself that they’re exactly what you need in your life, and what amazing luck it is luck it is that they’re so cheap out here. Before you know it, you’re trying to figure out whether this bright purple pair will compliment your tan or if the full-length grey parachute pants will disguise your rice bloated belly better. My love of slicker city fashion was soon being muffled by linen as I wandered the streets checking out the seasonal old travellers in their trusty tregs, and new pale explorers flinging around bright exciting new cloths! I havent succombed (yet!) 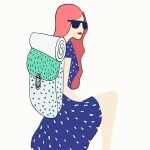 to the siren of the surrounding free-spirited styled fashion, mainly due to my self-imposed budget still being effective, and the wise words of my sister still ringing in my ears: “When you go travelling in backpacking central, your tastes will change! You’ll consider things that you wouldn’t touch in England!” – I’d scoffed at the thought, but unfortunately she was right. However, I came across this mystery British travelette (didn’t get a chance to chat to her due to dashing to a hotel to meet a tour group). Yep, she’s wearing hareem pants. Yep, she’s wearing a bum-bag. But hot damn she carries it off in a way that doesn’t scream “I’m a tourist, come have my passport!”. A cool twist on the hippy-chic. Upon meeting the tour group, I met the lovely Rachel, 21, from Cambridge, England. 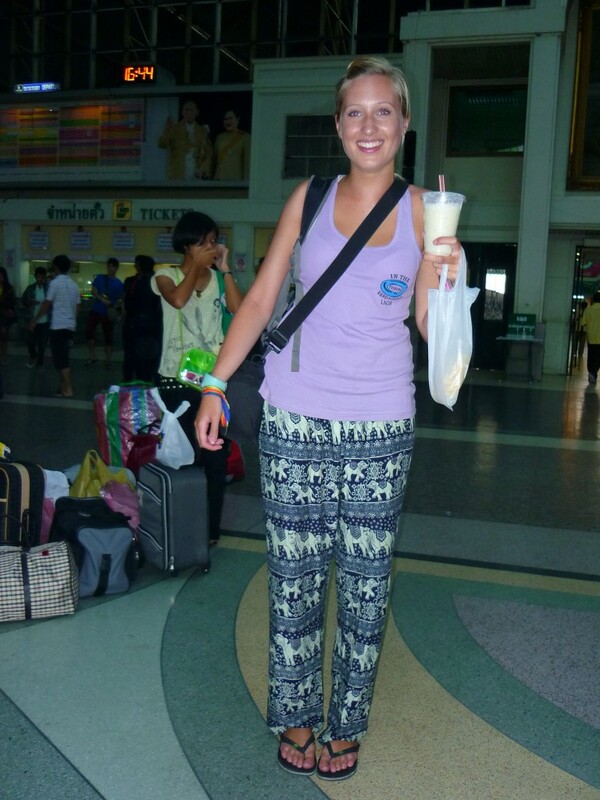 I had to document her amazing elephant travelling pants that she picked up down in Koh Phangan a couple of weeks ago. 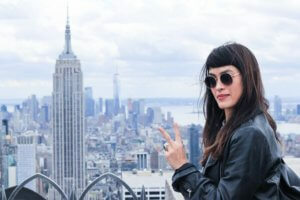 She’d hit up the southern islands a month ago after earning the travelling funds after her animation degree. She’d met a travelling partner and soul mate down there, and from the amazing times they had, they left with matching tattoos and elephant pants. They do look insane, but the memories attatched to them speak louder than the print. And yes. 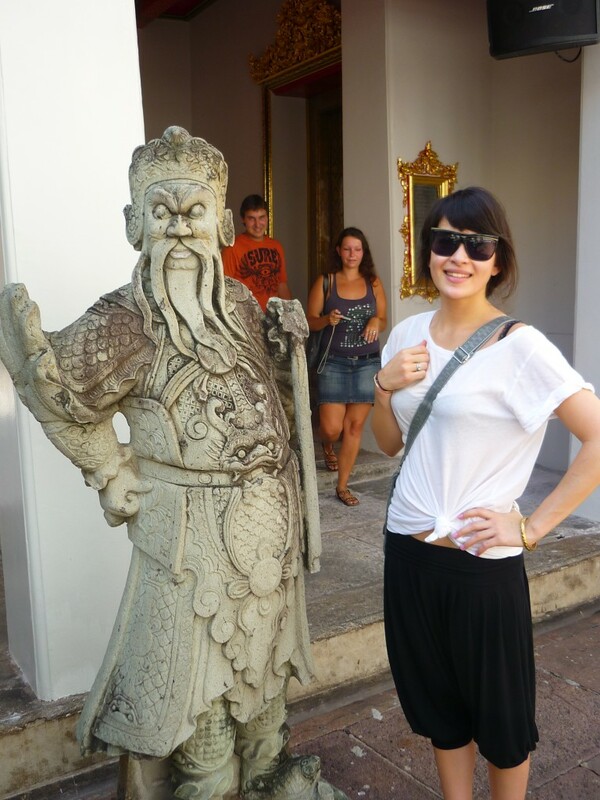 Here I am demonstrating a pair of black hareem pants at Wat Po in Bangkok, which I purchased in Paris a few years back. I’ve found that a) I’ve packed very little clothes that actually go together, and b) travelling requires adaptation. I may live in black clothes/short skirts etc in England, but with so many temples and modest monks lurking about in Buddhist Thailand, things definitely had to be altered. Nothing above knee-length or shoulder revealing is allowed if you want to check out the beautiful famous Wats (temples), so that is currently my excuse. 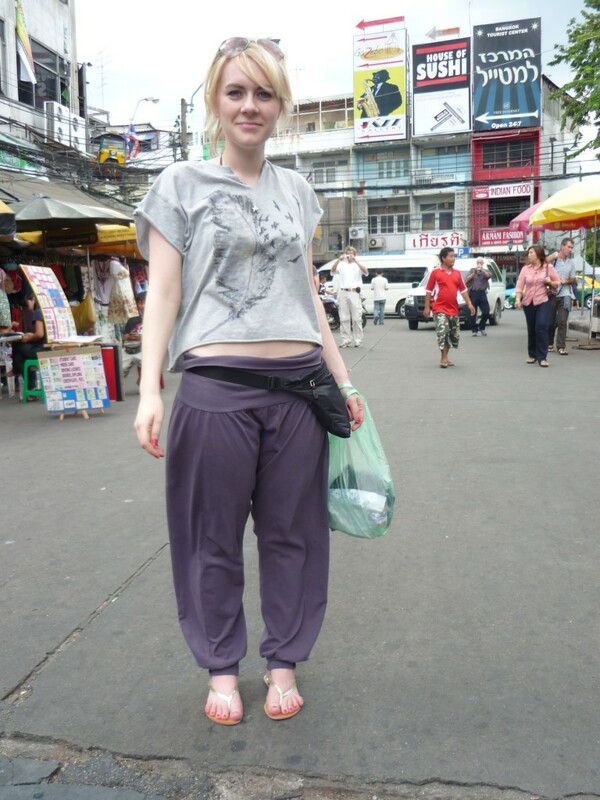 Modesty is my policy when it comes to wearing the backpackers fashion staple trousers! The comfort and stretchy, non-judging waistband is a bonus. I remember buying some of those in 6th form and u all laughed at me!!! I'm loving the fashion story, reminds me of the days of Exepose!! You're looking fantastic and the travelling sounds awesome! I'm glad you're meeting loadsa of people there too- keep safe! !